This image covers a portion of the wall-terrace region of the 100 km-wide Columbus Crater located within Terra Sirenum in the southern hemisphere of Mars. 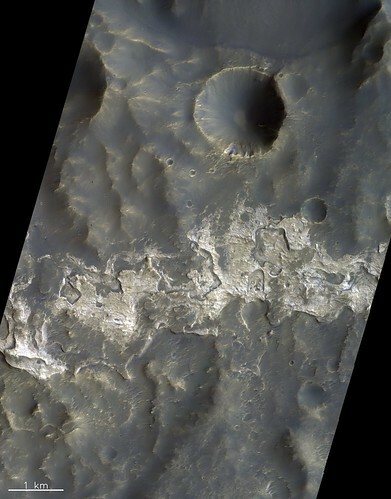 The image was taken by the Colour and Stereo Surface Imaging System (CaSSIS) onboard the ESA-Roscosmos ExoMars Trace Gas Orbiter on 15 January 2019. Layered rocks that appear in light-tones are found extensively on the northern crater walls, terraces and floor. These rocks have subsequently been eroded to expose successive layers in cross-section. The CRISM spectrometer onboard NASA’s Mars Reconnaissance Orbiter has already revealed that these layers contain various hydrated minerals, such as sulphate salts that appear to cover the white-coloured rocks. The beige-coloured layered rocks, consistent with a sulphate salt signature, appear to line the crater wall, reminiscent of a high water mark. These ‘bathtub rings’ are consistent with deposits formed by lakes that start to dry up and, through evaporation, begin to deposit specific minerals turn by turn. As the water evaporates, the minerals that are the least readily dissolved in water will begin to precipitate out of the dwindling solution. The relatively small 1.6 km-wide impact crater towards the top of the image appears to have a small amount of white-coloured bedrock exposed in its wall, which CRISM indicates is aluminous clay-bearing material. This suggests that the clay-bearing rocks are older than the sulphate salts that occupy the central portion of this image section. Sites like these could have once offered conditions suitable for life. The image is centred at 28.79ºS/193.84ºE. North is up.